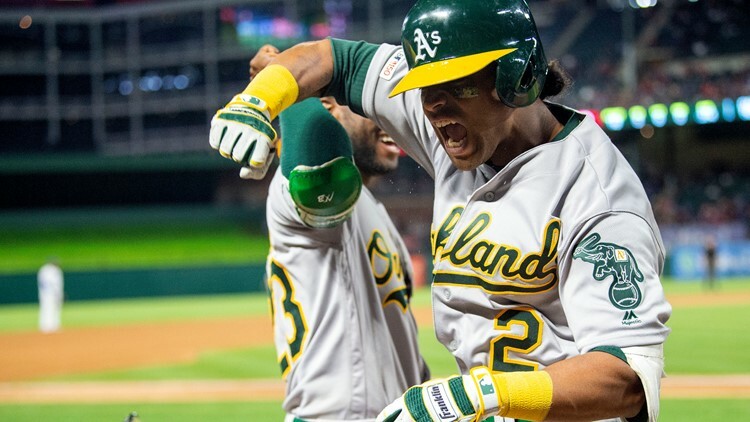 ARLINGTON, Texas (AP) - Khris Davis hit his major league-best 10th homer, his fifth in three games being a tiebreaking solo shot in the eighth inning, as the Oakland Athletics rallied from a five-run deficit to beat the Texas Rangers 8-6 on Friday night. Davis, coming off consecutive two-homer games in Baltimore, was 0 for 3 with a fielder's choice RBI before his one-out 426-foot shot to center in the eighth off Chris Martin (0-1) made it 7-6. It was the 28th homer by Davis against the Rangers since the start of the 2016 season, the most by any player against any team in that span. Lou Trivino (1-0), Oakland's third pitcher, worked 1 1-3 scoreless innings with two strikeouts. Blake Treinen got the final four outs, including three strikeouts, for his fifth save in six chances. Stephen Piscotty, in a 1-for-19 slump, was dropped from third to sixth in Oakland's batting order. He singled in the second and scored on Jurickson Profar's double that came in his first at-bat as a visitor in Texas. Piscotty later had an RBI double that capped a four-run sixth and got the A's within 6-5. Profar was dealt from the Rangers to the A's as part of a three-team, seven-player deal last December and is Oakland's starting second baseman. His big league debut was with Texas in 2012, and last season he started games at all four infield positions. Drew Smyly, who pitched only 6 1-3 innings combined in his first two starts for Texas, made it into the sixth with the 6-1 lead before allowing the first three A's, including his only two walks, to reach that inning - all three scored after he was pulled. The lefty struck out five. ... A's starter Mike Fiers allowed six runs for his second start in a row. He made it five innings against the Rangers after only 1 2-3 innings at Houston last Saturday. Rangers: 2B Rougned Odor was a late scratch from the starting lineup because of a sore right knee. ... RHP Edinson Volquez, on the injured list since April 5 with a sprained right elbow, won't throw for at least 4-6 weeks. The 35-year-old pitcher will have an MRI and be re-evaluated before he resumes throwing. Rangers: Right-hander Adrian Sampson (0-1, 1.86 in two relief appearances) takes over Volquez's spot in the rotation.